Jadaliyya: Defiant Turkish demonstrators ‘finding new ways to protest’: Turkey page co-editor Nazan Ustundag on Democracy Now! This is an interview conducted with Turkey Page Co-Editor Nazan Üstündağ on the ongoing state repression of protests in Turkey. The interview addresses the Turkish government’s violent crackdown and how Turkish protesters have developed new strategies to express their dissent. 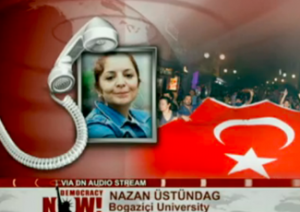 Below is a transcript of Nazan Üstündağ’s appearance on Democracy Now. Nermeen Shaikh (NS): Anti-government protests are continuing in Turkey despite an increasingly violent state crackdown. On Tuesday, Turkish police arrested eighty-seven people in a series of raids targeting those suspected of participating in weeks of anti-government protests. Earlier today, police used water cannons to disperse hundreds of protesters in the Turkish capital of Ankara. The Turkish government is now threatening to send in armed troops into cities. Meanwhile, a performance artist named Erdem Gündüz has become the new symbol of the protest movement. Nicknamed “The Standing Man,” Gündüz attracted international attention for standing quietly in Taksim Square for eight hours on Monday to protest the police crackdown on protesters. Images and video of him standing silently in the square have gone viral and inspired similar passive resistance protests across Turkey. Amy Goodman (AG): For the latest from Turkey, we go now to Istanbul, where we’re joined by Nazan Üstündağ. She’s an activist and scholar based in Istanbul who’s been involved in the Taksim Square protests since they began. It’s great to have you back, Nazan. Can you talk about what’s happening at this point, the mass protests, then word there was an agreement between the prime minister and the protesters, and then word that that agreement broke down? Why are people still on the streets? Nazan Üstündag (NÜ): Well, there is a misunderstanding about that. There hasn’t been actually an agreement with the prime minister. The prime minister said that we should immediately evacuate the park and that he will wait for the court decision, which is actually not a concession but a normal thing. I mean, he has to wait for the court decision; he cannot override the court. But there were five—four other demands that the protesters have done, and he didn’t take any of them seriously. And at some point in the meeting, he left the room, so there wasn’t really an agreement. But, on our side, we were thinking of leaving the park anyway and just leave a symbolic tent just to show our good intentions. But still, before we could make a final decision on that, there was the police attack. So, there was still a disagreement, and there wasn’t any kind of concession made by the prime minister, but we were planning, as the Taksim—Taksim solidarity platform was actually proposing to leave the park and to just leave a symbolic tent, and that’s when the police raids started. NS: And, Nazan, can you say—you refer to four other demands that the protesters made, which the prime minister disregarded. Could you explain what those four demands were? AG: Nazan, this is the Prime Minister Erdoğan speaking Tuesday. He described the protesters as invaders. PRIME MINISTER TAYYIP ERDOĞAN: [translated] We did what we had to in a state of law. We have cleared out Taksim Square and Gezi Park from these invaders. You know, they’ve destroyed everything. We’re planting trees and flowers again. AG: That was the Prime Minister Erdoğan. Nazan, your final comment on what the prime minister said and what is happening today? NÜ: Well, what’s happening today is people are finding new ways to protest. As you have mentioned, we have the Standing Man, but that’s not the only thing. We have now started to go to other parks in Istanbul. Instead of in Gezi Park, now we are—we have distributed—our group has—I mean, like, there are thousands and thousands of people attending every day after their jobs, all the public parks. And we are coming together, discussing what we are going to do next, how we are going to organize, how we are going to voice our democratic demands, because what the prime minister says is, again, a lie. We have the democracy in Turkey. Our right to freely associate and to freely express ourselves is under—is constitutional. So he’s lying. What he does is actually unlawful. And we are trying to come together and make the world hear our voice, organize ourselves even stronger and continue our resistance to this. AG: Nazan Üstündağ, we want to thank you for being with us, activist and scholar based in Istanbul, Turkey. She’s been involved in the Taksim Square protests since they began. This entry was posted in Interviews, Texts and tagged democracy now!, duranadam, Erdem Gunduz, nazan üstündağ, protestors, ustundag on 20 June 2013 .